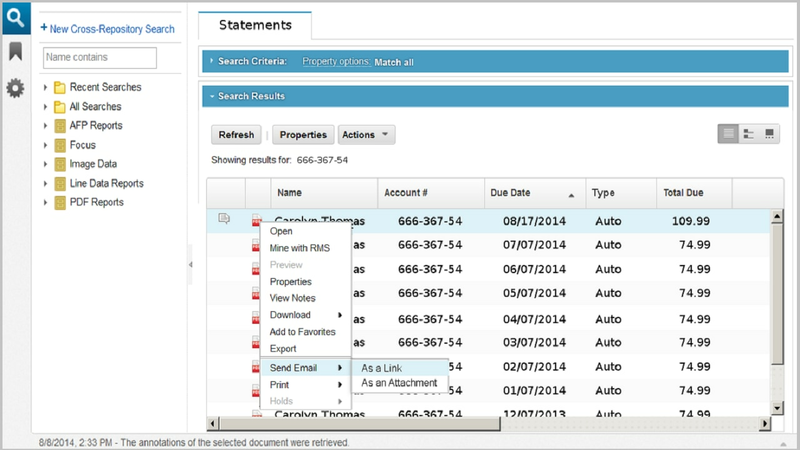 IBM Content Manager OnDemand (CMOD) on Cloud enables customers to archive reports, correspondence, and transactional records on IBM Cloud. Built on the market leading on-premise offering, IBM CMOD on Cloud is hosted on a secure, single tenant infrastructure. Users can rapidly deploy customer service e-presentment and report distribution applications to desktop and mobile devices, and quickly implement customer self-service applications via integration of a customer's system of engagement. Click the button below to watch the Demo for Banking, or see Resources below for additional industries. Provides a single tenant private infrastructure provisioned across dual data centers for high availability, including routine maintenance, backups and updates. Allows your IT staff to focus on other business priorities through supervision of application specific administration tasks. Streamlines your customer service by empowering CSRs to quickly access customer correspondence through web and mobile access. Automatically archive a wide range of transactional documents , reports and customer communications. Enables recurring loading and distribution of reports to designated internal users.